This week, oil prices have trended negatively, with traders shedding their positions following a bearish inventory report. Crude inventories rose by over 5 million barrels the week before Labor Day, when prices are historically reaching their peak. It’s an unusual dynamic, but then again prices have been unusual this year compared to the last few years. The irony if this week’s decline is that traders are increasingly betting on higher prices for the rest of the year. Options markets are showing the equivalent of 93 million barrels bet on Brent crude oil hitting $100 this year. Behind these bets is the expectation of declining production globally, which the U.S. and OPEC could have a hard time counteracting. Merrill Lynch expects prices could reach $100 by the middle of next year leading up to changes in maritime fuel spec. Other banks have predicted $90/bbl crude this year. Of course, inventories will dictate whether these analyst forecasts are achievable. Tight supply will show up in the form of declining inventories, so markets are highly reactive to what inventories do. Rising crude inventories are counter-seasonal for late May, so they disrupt the narrative of higher prices. But one week’s inventory data does not identify a trend. The long-term trend is lower crude and fuel inventories, and it will take a long-term change to disrupt that trend. WTI crude oil opened the week at $71.47/bbl, one of the highest weekly opening prices in years. Prices rose on Tuesday, reaching a peak of $72.83 before beginning to decline. Wednesday’s crude inventory build was the turning point, with prices falling about a dollar lower than Tuesday’s high. The bearish response has continued throughout the week, with crude oil prices opening at just $70.65 this morning, a loss of 82 cents. Crude is trading below $70 currently. Friday afternoon rallies are not uncommon, however, so don’t rule out the possibility of the week closing above $70. Diesel prices managed to hold their ground for much of the week, but today are shedding gains rapidly along with crude. 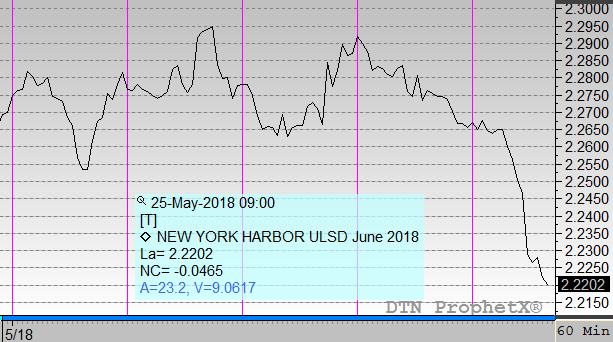 Prices opened the week at $2.2655 and rose to just shy of the $2.30 mark. 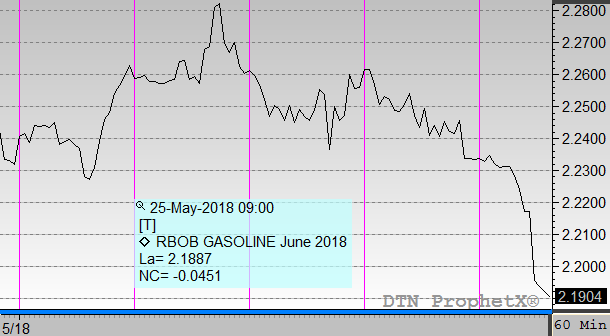 A diesel inventory draw helped to keep diesel prices elevated, but this morning the product is reacting to lower crude prices. Diesel opened at $2.2648 this morning, very close to the week’s opening price. Unless losses are reversed this afternoon, though, the week appears destined to end well in the red. Gasoline prices, like diesel, opened this morning very close to their Monday opening price of $2.2333. Gasoline has traded a few cents behind diesel prices, at times closing the gap but usually falling back to trade 2-3 cents below diesel. Like diesel, gasoline prices appear poised to end the week in the red, absent any major market rally.